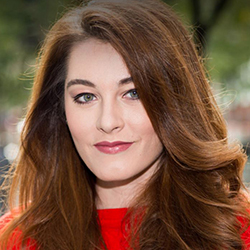 Award-winning singer, songwriter and motivational speaker Mandy Harvey will appear on June 25 at the 55th NATS National Conference in Las Vegas. Despite her invisible disability, Mandy’s true passion will never be denied. Though her hearing loss is profound, her timing and pitch are perfect and her passion is tremendous. With support from friends, family and her faith, Mandy continues to find joy in music. She continues to make a tremendous impact around the world, most notably as a recent finalist on America’s Got Talent. Mandy’s message is universal: Hope, Dream, Believe... no matter what. 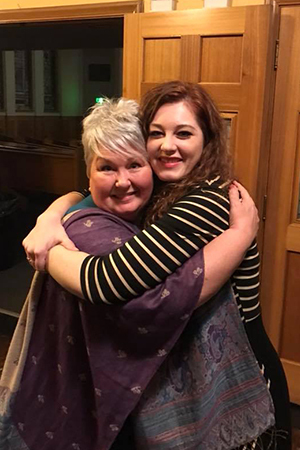 Mandy Harvey, pictured with former teacher and NATS member Cynthia Vaughn. They reunited as Mandy launched her national tour in February 2018. 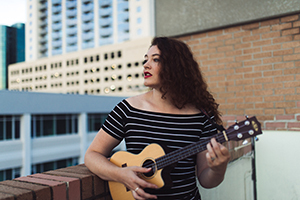 In 2011, Mandy won VSA’s Top Young Soloist Award and lived a personal dream of performing at the Kennedy Center in Washington, D.C. She continues to perform around the United States and has been recently featured on NBC Nightly News, Canada AM, and The Steve Harvey Show. In addition to performing and speaking, Mandy has become an ambassador to both No Barriers USA and Invisible Disabilities Association with a mission to encourage, inspire and assist others to break through their personal barriers, challenge stereotypes, and lead the charge toward a brighter future for all. Listen to Mandy's podcast interview with Mark Pattison. In addition to reaching the finals of America’s Got Talent and winning Simon Cowell’s “Golden Buzzer,” her appearance on CNN’s “Great Big Story” captured over 10 million views on social media. Burt’s Bees signed her up for their “Remarkable Women” campaign and she is performing at the world’s most prestigious clubs, concert stages and festivals. Not content to rest on her burgeoning recording career, her live performances, and her inspirational speaking, Mandy just released her first book, Sensing The Rhythm, Finding My Voice In a World Without Sound, published by Howard Books/Simon & Schuster, with a message of helping others to realize their dreams and pursue their hopes.